Soybean mosaic virus (SMV), a species of the Potyvirus genus in the Potyviridae family, is one of the most typical viral diseases and results in yield and quality loss of cultivated soybean. Due to the depletion of genetic resources for resistance breeding, a trial of genetic transformation to improve disease resistance has been performed by introducing the SMV-CP gene by the RNA interference (RNAi) method via Agrobacterium-mediated transformation. Among 30 transgenic plants produced, 7 lines with enough seeds were infected with SMV and two lines (3 and 4) showed viral resistance to SMV infection. In genomic Southern blot analysis, all the lines tested contained at least one T-DNA insertion. Subsequent investigation confirmed that no viral CP gene expression was detected in two SMV-resistant lines after artificial inoculation of SMV, while non-transgenic control and other transgenic lines expressed substantial amounts of the viral gene. Viral symptoms affected seed morphology, and clean seeds were harvested from the resistant lines. Also, strong viral gene expression was detected from the seeds of susceptible lines. 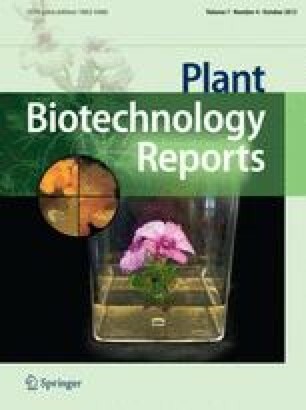 In further generations, the same phenotypic appearance was maintained among non-transgenic and transgenic plants. Finally, the presence of helper component-proteinase (HC-Pro), known as a suppressor of gene silencing apparatus, was checked among transgenic lines. No expression of HC-Pro in resistant lines indicated that the viral CP-RNAi transformation into soybean somehow created a functional gene silencing system and resulted in a viral-resistant phenotype. H. J. Kim and M.-J. Kim contributed equally to this work. The online version of this article (doi: 10.1007/s11816-013-0279-y) contains supplementary material, which is available to authorized users. This research was funded by Dong-A University.